I finally think that Spring might be coming to Baltimore. We are going to have a night this week close to freezing, but Spring is really trying to push through. We have been busy! Unfortunately busy means that I do not have as much time to write, so I am going to try and bring everyone up to date on the farm. We have many new inhabitants of the farm, 60 some I think. I hate to say that I have lost count! We have our “meat birds”, that we raise out for our family’s year supply of chicken. This year we are raising Rainbow Reds. These are a pasture chicken that does not have as much breast meat as the Cornish Crosses but still produces a 5 pound roasting bird. 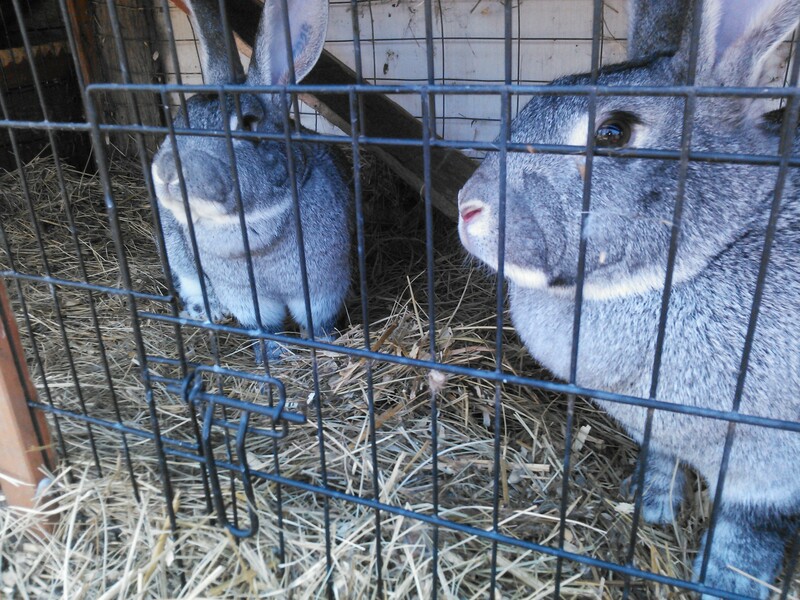 We also have a couple Cornish Crosses, because they were on sale at Tractor Supply. That store is dangerous in the Spring! Total we have 30 meat birds. They are scheduled to go to butcher the middle of May. 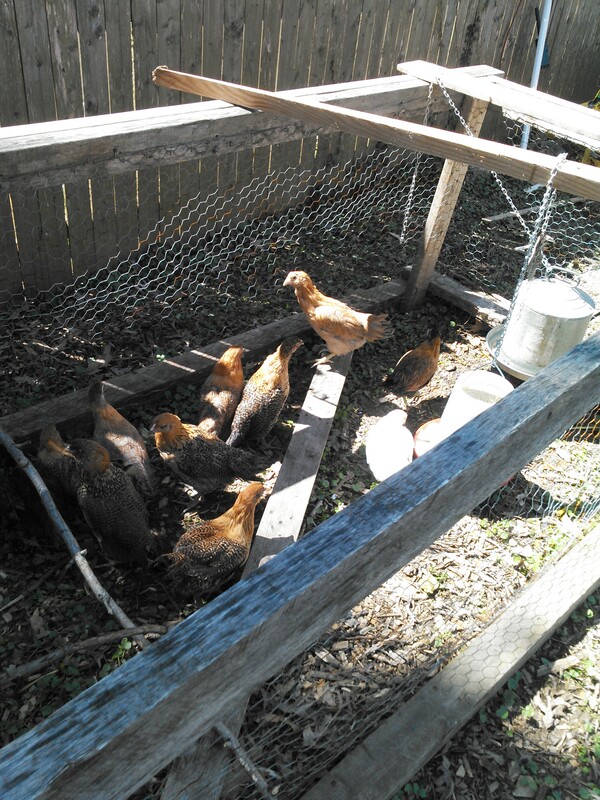 Laying hens: Our current laying flock is getting to be of the age that it is time for them to be soup. We have 14 birds and we are lucky if we get 7 eggs. We have had 3 become egg bound in the last month and a half. I hate to see them suffer and I really hate to waste the meat. So we prefer to butcher them before they start to have problems, this way nothing goes to waste. We keep debating whether all 14 are headed to the soup pot, or if we are going to try and wean out the ones that are still laying. That decision is still up in the air, I hate to go a couple months with no eggs. We are raising out new laying hens. They are 8 weeks old right now. 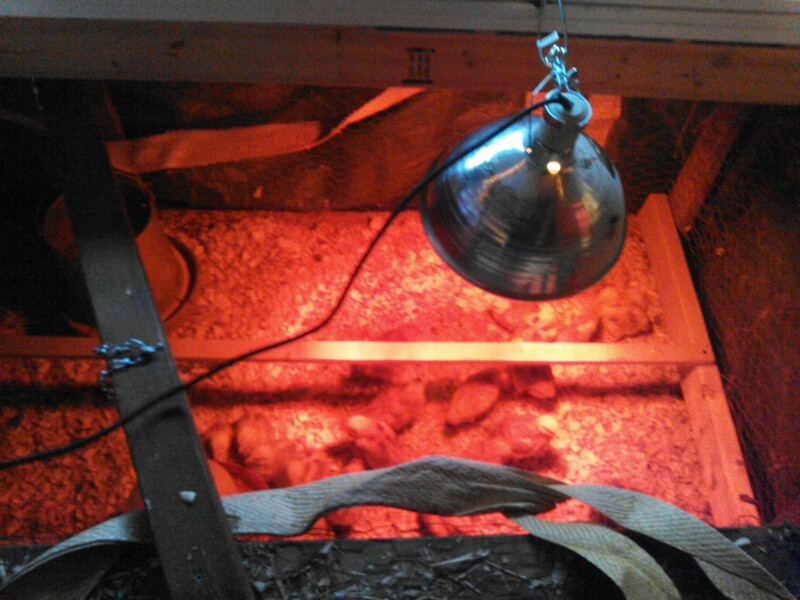 We chose to raise 15 Ameraucana Chickens this year. These birds will lay blue or green colored eggs. I am excited to get the colored eggs, but I have to say I am not impressed with the breed so far. These birds are very skidish. We have never had birds that we could not easily pick up. We handle these birds twice a day and they are still very skidish. When you stick your hand in to change the water or to feed them they freak out, flying against the walls and screaming. The meat birds that we are raising are so much calmer than these birds and those we don’t pick up often. Hopefully they will calm down soon. 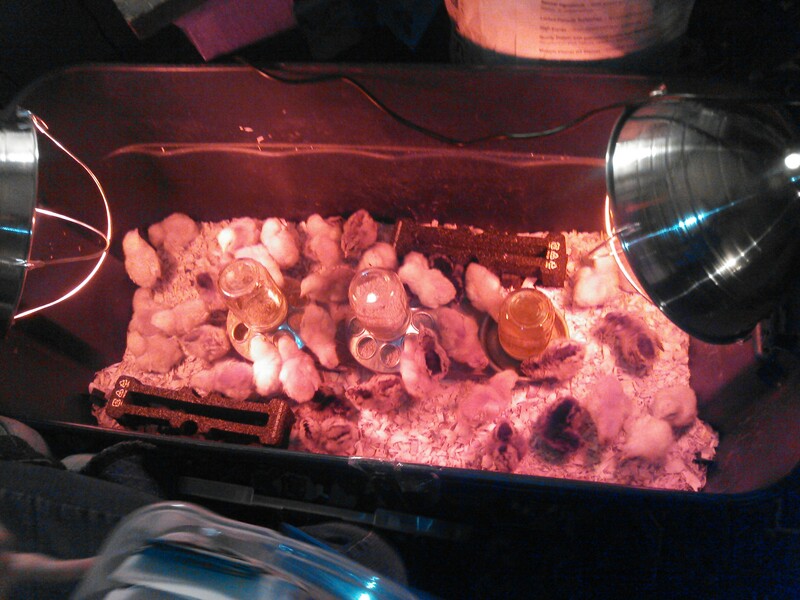 We also have 6 random laying chickens from Tractor Supply that we used for a Urban Farming presentation. I told you that store was dangerous. They are incredibly friendly and do not see why chickens need to be kept outside, when the living room is so warm and full of kids that feed them leftovers from lunch and dinner. 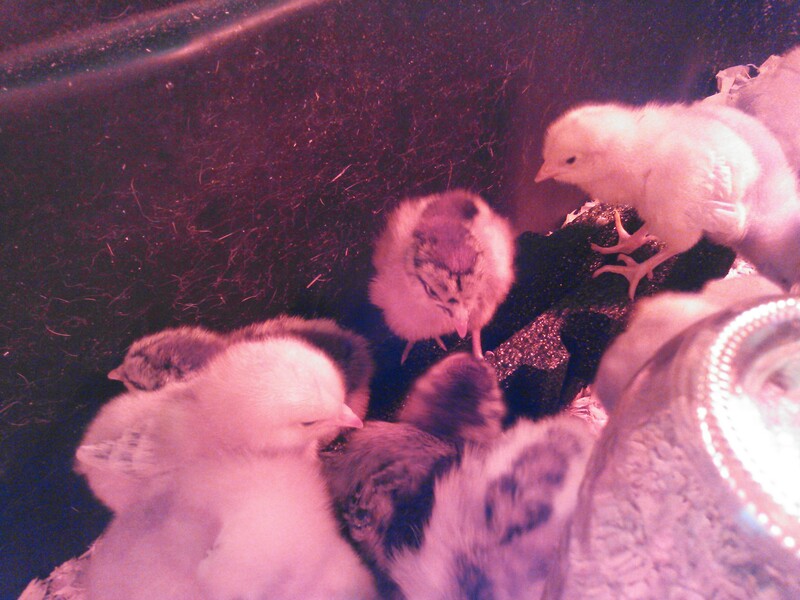 They were moved out to the brooding barn this week, much to their dismay. Ducks: Yes I said ducks. These were purchased just for my Urban Farming presentation, for the 100% cute factor. 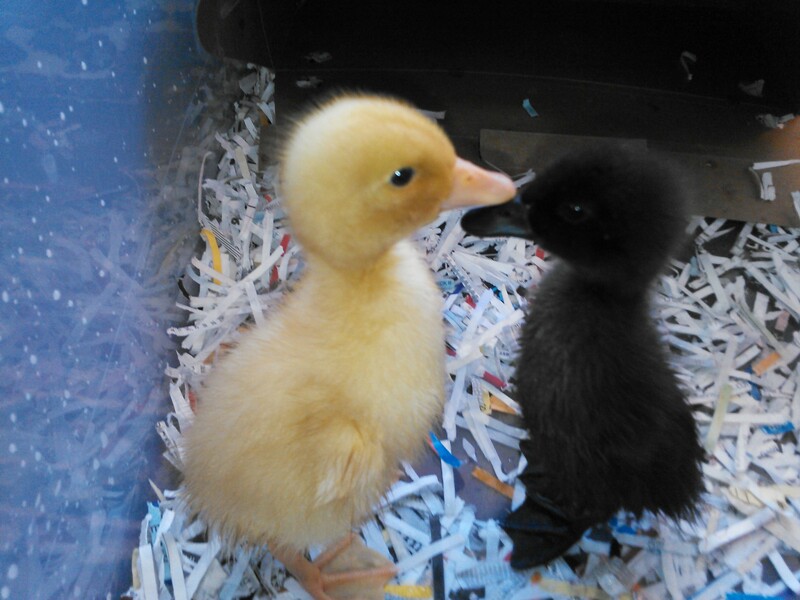 One is a yellow Pekin Duckling and the other is a Black Runner Duckling. I had already found a farm that would take them after the presentation. This farm even had a pond for them to go live in. Well, I am a complete softly and have fallen head over heals in love with this crazy ducks. They still live in the living room, because the kids can not bear the idea of them being outside. They eat their breakfast of greens while taking their morning swim in the bathtub. They are then dried off with towels by the kids while watching morning cartoons. 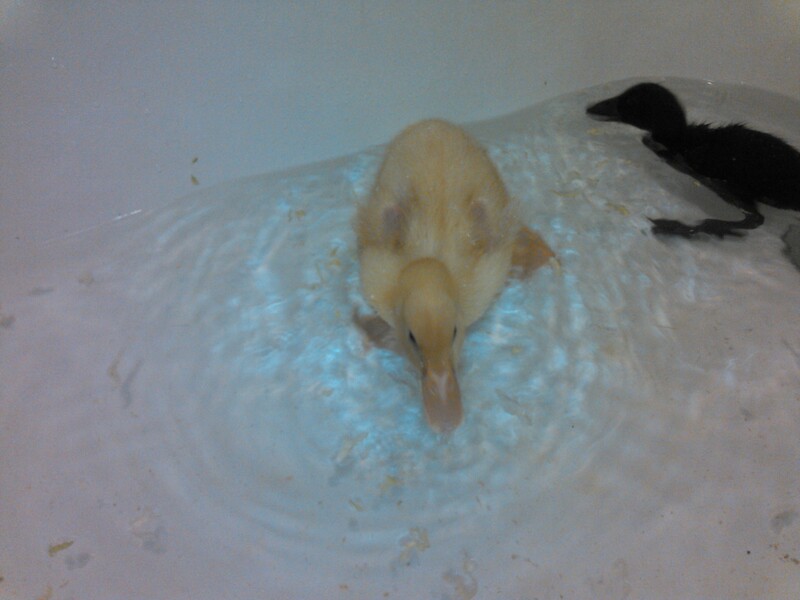 The ducks have imprinted on my 6-year-old daughter and it is cute beyond words. They follow her everywhere. She is diligently working on teaching them their ABC’s and 123’s. She feels all ducks should be properly educated. Needless to say, the ducks that were never meant to live at my farm, now have names and are not going anywhere, anytime soon, except to play house in the backyard with my daughter. That is all for new animals. We still have the rabbits. We have 3 does still available for sale, after we sell those does we will not breed again still August. We will maintain our breeding stock of 3 bucks and 3 does. These rabbits are absolutely amazing. We took one of our youngest does out to the Urban Farming presentation. There was 50 plus people that wanted to love on her and touch her. She loved every minute of it. She was passed around, flipped upside down and petted for two hours. She never ran from the kids, she let everyone one of them love her. The only rabbits I have ever owned is American Chinchilla Rabbits, so I just assumed that this is how ever rabbit acts. I was amazed at how many people came up to me and told me stories about how grumpy their rabbits were. If you are looking for a rabbit, American Chinchillas are the best way to go, they are fabulous rabbits. Fish: Our tilapia are finally outside! The weather has finally become warm enough for them. Right now we have put them in the sump tank. I have kept the smallest of the fish in the house, so that they can get the food they need to grow. Veggies: We have started our seeds and we have some of our over winter veggies that are growing well. I will do another post about veggies so that I don’t go over 1,000 words in one post…. yes I know I need to post more often, I will work on it. Big BIG things are happening on our Farm. I can’t wait to share all the details about it in the next week our so.